Fire Rated Glass in Exits – This article explains the origins of codes related to exits and means of egress, and the definition of components of Means of Egress. Since the catastrophic New York City Triangle Shirt Factory fire in 1911, regularly updated fire and building codes have been implemented to limit the spread of fire, smoke and heat, with an emphasis on maintaining a safe means of egress for people exiting in the event of a fire. Today, there are two primary code standards that regulate the means of egress: the International Building Code (IBC) and the National Fire Protection Association’s (NFPA) 101 Life Safety Code. The IBC defines means of egress as “continuous and unobstructed path of vertical and horizontal egress travel from an occupied portion of a building or structure to a public way.” A means of egress consists of three separate and distinct parts. Exit access – the portion that leads from the occupied area of a building or structure to an exit. 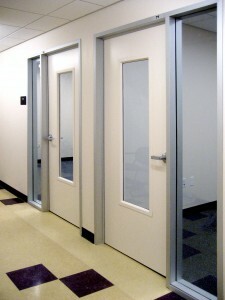 A corridor is an enclosed exit access providing a path of egress travel to an exit. 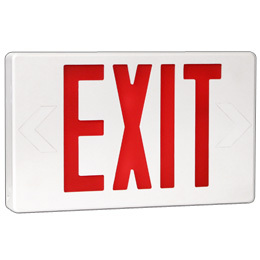 Exit – the portion of a means of egress system which is separated from other interior spaces of a building or structure by fire-resistance-rated construction and opening protectives as required to provide a protected path of egress travel between the exit access and the exit discharge. Components of an exit include doors at grade level, interior enclosed stairs and ramps, exterior stairs and ramps, horizontal exits, exit enclosures and exit passageways. Exit Discharge – the portion between the termination of an exit and a public way. There are some exceptions which allow vestibules and lobbies within the exit discharge. To qualify, they have to be separated from the floors below by a fire-resistance rating equal to the exit enclosure. In addition, lobbies must be separate from other areas of the same level by a fire-resistance rating equal to the exit enclosure. The IBC’s Chapter 10 outlines regulations related to means of egress including rules on occupancy load, accessibility, illumination, width, doors, stairways, ramps, exit access, exit doorways, exit access travel distance, corridors, exits, exit enclosures, and exit passageways. The requirements vary based on building size, occupancy, use and other factors. The following are some examples of code requirements and fire rated glazing products that meet the code requirements. Please refer to FAQs to learn more. The IBC requires different ratings for protected openings in a 60-minute exit corridor depending on the glazing application. 20-minute fire doors with 20-minute vision panels without hose stream are permitted in a 1-hour exit corridor. Sidelites and transoms around a 20-minute fire door in a 60-minute exit corridor require a 45-minute fire rating with hose stream. 45-minute fire protective windows are permitted in a 1-hour exit corridor, up to a maximum of 25% of the wall area as viewed from within the room along the corridor. If a designer wishes exceed the 25% limitation, then 1-hour fire resistive glazing, like SuperLite II-XL 60, should be used to meet code requirements.